Now that the Senate has overwhelmingly passed the criminal justice reform bill backed by President Trump, criminal justice expert Paul Brakke has hailed this effort, which he has long supported in his books and articles about prison sentencing reform. The Senate version of the bill will now go to the House, where it is expected to pass and then be signed by the President. Essentially the bill will allow thousands of prisoners to obtain an earlier release from prison and reduce many more prison sentences in the future, so it will contribute to reduced incarceration and recidivism. Among other things, the bill will protect first-time offenders from mandatory minimum sentences and ease the three strike rule, so people with three or more convictions, including for drug offenses, will get 25 years instead of life. Plus, inmates can earn more good time credits by avoiding a disciplinary record, and they can get earned time credits by participating in more vocational and rehabilitative programs, so they can be released early to halfway houses or home confinement. Besides reducing prison overcrowding, the educational programs can provide ex-cons with new job skills, so they are less likely to commit new crimes and therefore the bill helps to reduce recidivism. Brakke has long favored such reforms as the publisher of American Leadership Books, which specializes in books on crime and criminal justice. These books have included The Costly U.S. Prison System, and a chapter on prisons in his latest book Crime in America: Conservatives’ Approaches toward Criminals, Police, Criminal Justice, and the Opioid Crisis. In writing about the prisons, Brakke has recommended that sentencing laws be changed in exactly the way described in the bill to provide more rehabilitation efforts for prisoners and to enable judges to exercise more discretion in sentencing nonviolent offenders to reduced sentences, especially for drug offenses. As Brakke has emphasized in his books, reduced incarceration results in lower levels of recidivism, because shorter sentences helps to keep the families of ex-cons together, and ex-cons are better able to find jobs and become productive citizens, so they have less need to return to crime. According to Brakke, the passage of this bill is critical, because for decades, the sentencing laws have unfairly impacted minority communities and contributed to the high rate of poverty and crime in the inner cities. But now it seems Congress, along with the President, have finally come together in a spirit of bipartisanship to support this bill, which will make America safer. As Brakke notes, “This bill will contribute to a safer America, as well as reduce the unnecessary costs for imprisoning low-level offenders with long sentences.” Brakke further emphasizes that “It makes sense to change our sentencing laws to create a win-win for prisoners, their families, and American society as a whole. Brakke also considers the bill especially important because it appeals to both conservatives and liberals. As he observes, the bill incorporates the conservatives’ concerns with creating a more effective cost-effective prison system and the liberals’ concern with helping prisoners become reintegrated into the community, keep their family together, and get the necessary training to get a job. So it’s “win-win” for both sides of the aisle. 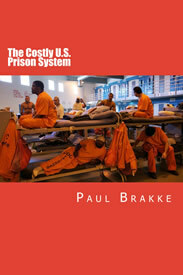 Brakke’s books on The Costly U.S. Prison System and Crime in America are part of the series of books on crime, criminal justice, and American society from American Leadership Books. 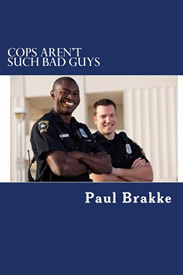 In Crime in America, which provide an overview of crime patterns and how the criminal justice system, including the prisons, works — or doesn’t, Brakke offers suggestions for improving the system. For instance, he has long advocated finding ways to reduce the prison population, since the U.S. has the highest percentage of its population in prison in the world with about 2.2 million people behind bars as of 2016 — a nationwide incarceration rate of 860 prison or jail inmates for every 100,000 adults ages 18 and older, according to the Bureau of Justice Statistics. To learn more, you can now get a free review copy of Crime in America, which is available for pre-order, too, on Amazon. Brakke is offering these books for free to anyone who wants to review and comment on the book — just go to crimeinamericathebook.com to get a copy. Also, copies are available for government officials who might turn some of Brakke’s other suggestions for reducing crime and fixing the criminal justice system into legislation. Members of the media are invited to request copies of the book, too. 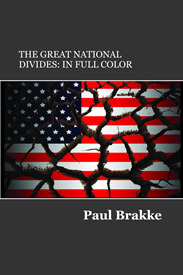 Brakke’s next books — Fractured America and Prisons in America — will be out in the next few months.